What Hath God Wrought? is a series of small games about the telegraph and its cultural and sociological impact in the 19th century. It has been featured at events such as IndieCade East, alt.ctrl.GDC, and the Indie Arcade at the Smithsonian American Art Museum. The piece features custom hardware for both input and output. Players enter morse code using a hand-built telegraph key, and receive messages from other operators via a physical telegraph sounder. The sounder is an authentic piece of vintage 19th century electronics. The on-screen visuals are entirely made up of found woodcut illustrations from the 19th century. The project is largely an exploration of the use of props as narrative engagement, and how we can use physical controllers to help encourage role-playing. 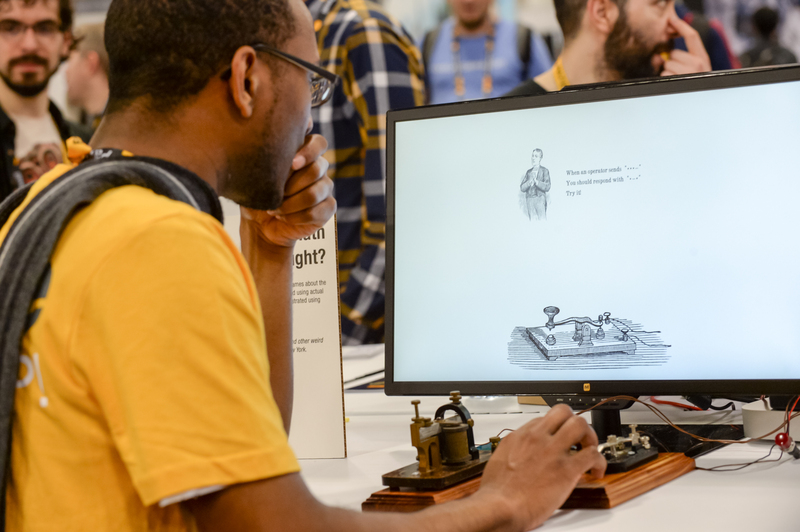 A few small games have been built for the platform, each exploring a different side of telegraph history and a different aspect of how physical controllers can be used. They range from a Twine game based on the 19th century romance novel Wired Love to a twitchy action game where you help ne'er-do-wells cheat at gambling. The game I've shown most publicly is a "Simon Says"-esque game where the player is introduced to a series of call-and-response rules: when the operator on the other end of the line sends a given message, the player must send a specific response. When learning a foreign language, there's a moment where you stop thinking in your native tongue and start thinking in your target language. 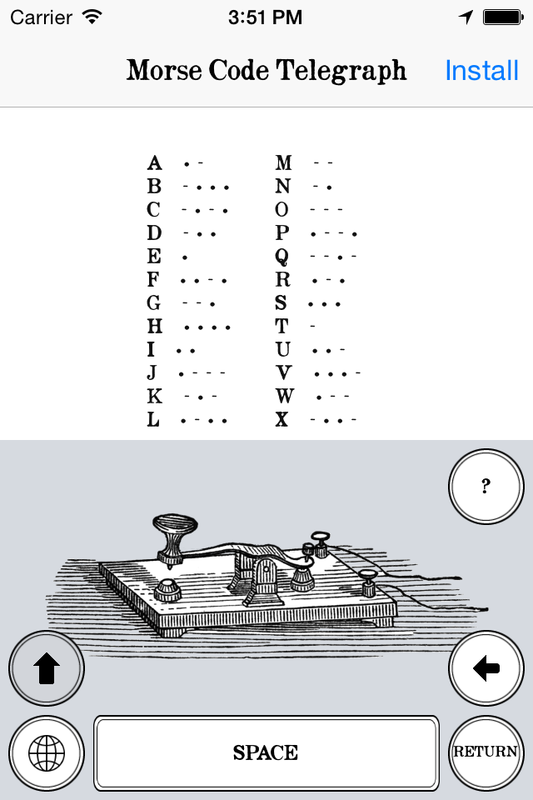 In the same way, this game is designed to get players to stop thinking of morse code as individual dots and dashes and start listening for overall letter shapes. After about five minutes of play, players get to experience the kind of mental shift in abstraction that typically only comes with deep mastery of a subject. I have also built a custom morse code keyboard for iOS that lets you tap out morse code in any iOS app. It's currently available for purchase on the App Store.